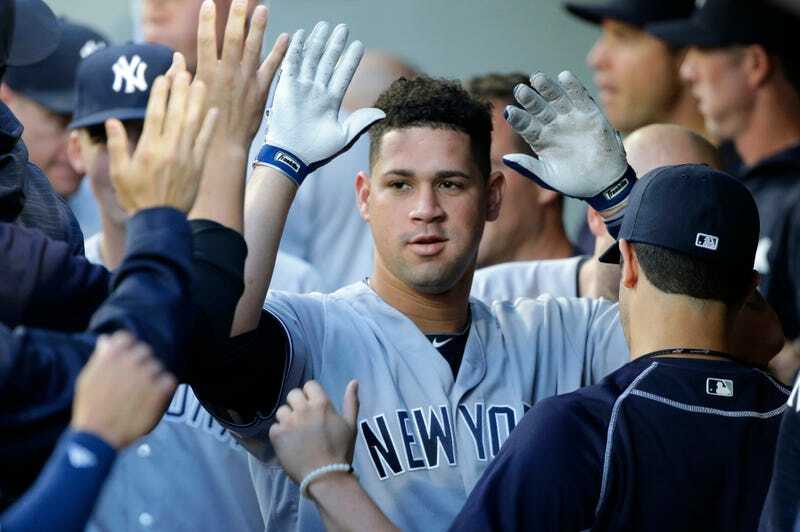 Gary Sanchez has had a start to his MLB career right up there with those of Yankees, uh, legends, like Shane Spencer and Kevin Maas and Shelley Duncan. With two more dang dingers last night in New York’s 7-5 loss in Seattle, the 23-year-old catcher now has eight home runs in his first 19 games—a franchise record. The fact that Sanchez has forcibly wrested the starting catcher’s job from Brian McCann, rather than being granted it to grow into it, is emblematic of the Yankees’ impending youth movement: the turnaround from overpaid and washed-up to young, cheap, talented, and ready is happening so quickly, with very little transition time in between. Once Mark Teixeira retires following the season, only Brett Gardner and CC Sabathia will be left from the 2009 World Series team. Starlin Castro and Didi Gregorius, both 26, will be among the “veterans,” but the bulk of the next generation is still arriving. There’s Sanchez, and outfield prospects Aaron Judge and Tyler Austin, who were called up last week and went back-to-back for their first career home runs. They could form the outfield of the future along with 2016 first-round pick Blake Rutherford, and Clint Frazier, who came from Cleveland’s system in the Andrew Miller trade and could be ready for his call-up as soon as next month. The middle infield is promising too, with top prospect Gleyber Torres, acquired from Chicago in the Aroldis Chapman trade, converting to second base because he’s blocked at shortstop by speedster Jorge Mateo. Judge and Austin are 24; Sanchez is 23; none of the others are older than 21. Give credit to GM Brian Cashman, who, when he was finally given the green light to blow up a roster that wasn’t going to make the playoffs, got himself a haul. It’s part luck and part planning that Miller and Chapman, two of the best relievers in the game, became tradeable in a year with relievers in high demand. Between those two trades and the one that sent Carlos Beltran to Texas, Cashman was able to stock his pipeline in record time—adding five top-100 prospects and building a farm system considered MLB’s best. From geriatric afterthoughts to looming power, with the bulk of that transmutation coming in the span of one week. The Yankees can spend their way to prominence, but it’s much more impressive that they’ve managed to avoid irrelevance the old-fashioned way.